Joint Mandate.Double storey family home with lagoon views, located on a large stand and has much to offer for a growing family. 4 bedrooms, double garages and staff accommodation. 2 of the bedrooms & 2 bathrooms are upstairs (1 en-suite) plus a lounge, dining room, and family kitchen. These living areas are warm, sunny and spacious and open onto a deck which has amazing lagoon views. On the lower level are 2 more bedrooms which lead out to another deck plus a bathroom and a kitchenette/ laundry. Direct access to the garages can be gained from the entrance hall on this level. There is also a store room, a car port and separate staff accommodation. Lots of space for the whole family! The property is a large level stand with a beautifully landscaped garden, an ideal playing area for children. The sunny north facing disposition of the house creates the perfect relaxing decks and garden. 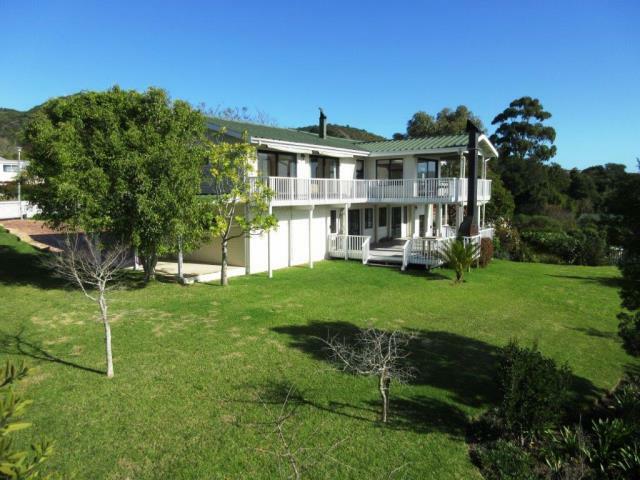 This property is situated close to the golf course and near the Knysna Lagoon and in an established sought-after neighborhood.